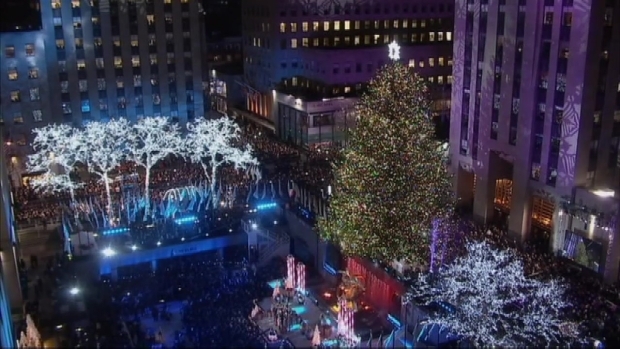 The Rockefeller Center tree was illuminated Wednesday night in one of New York City's greatest holiday traditions, capping a star-studded ceremony that lit up the plaza with favorite tunes and holiday cheer. The flick of a switch brought a burst of color to all 85 feet and 13 tons of the 90-year-old Norway spruce from Pennsylvania just before 9 p.m., in the 82nd annual edition of the iconic tree-lighting ceremony. Mariah Carey kicked off the event with a rendition of her number one smash hit "All I Want for Christmas Is You," before "Today" show hosts Matt Lauer, Savannah Guthrie, Al Roker and Natalie Morales introduced a star-studded lineup. 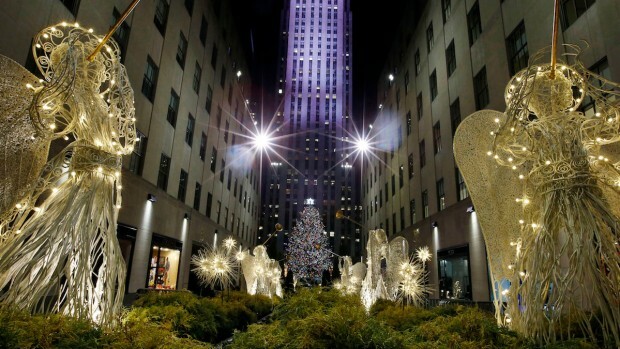 The Rockefeller Christmas Tree is lit on the plaza Wednesday. 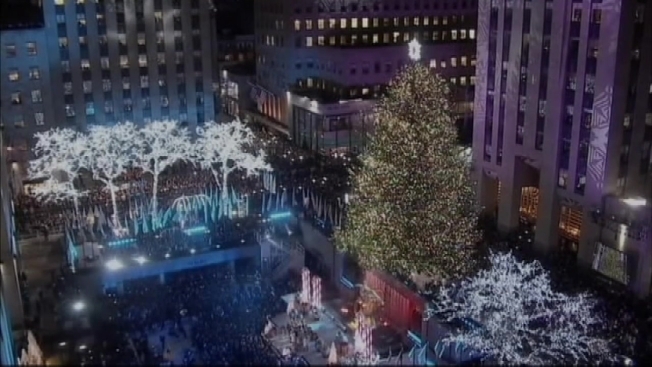 Video courtesy NBC Universal Inc.
Lady Gaga and Tony Bennett crooned a jaunty duet on "Winter Wonderland," the pop star clad in a white fur gown with a neckline that belied the chilly December air, before the a capella group Pentatonix performed "Santa Claus Is Coming to Town" and Prince Royce sang "Jingle Bell Rock." They were followed by Broadway star (and "Let It Go" hitmaker) Idina Menzel belting "Holly Jolly Christmas" and then country star Darius Rucker performing the seasonal standard "White Christmas." They were followed by Sara Bareilles, Seth MacFarlane, LeAnn Rimes and more, before country veteran Trisha Yearwood introduced the countdown to the tree's lighting with her own soulful performance. Thousands packed Rockefeller Plaza for the event, even as throngs of protesters headed there, too, hours after a grand jury controversially decide not to indict a police officer for the caught-on-camera chokehold death of Eric Garner. Mayor Bill de Blasio canceled his own expected appearance at the holiday spectacle after the news broke hours before it began. But the event continues as planned.